The male adult moth of this species has brown forewings each crossed by a variable broad expanding yellow diagonal band, and with an eyespot near each wingtip, and with a black mark halfway along the hind margin. 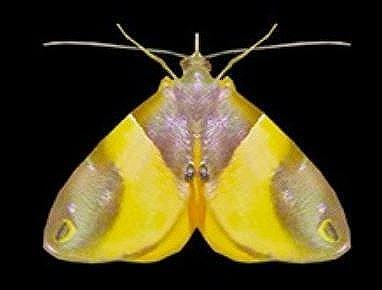 The hindwings are yellow. The wingspan is about 2.5 cms. Volume 23 (1916), p. 212, No. 9.